A service and instruction oriented Smoky Mountain fly fishing guide with more than 25 years in the business. 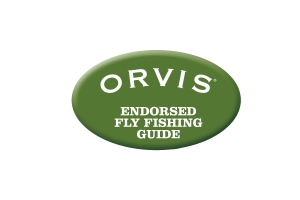 A proud member of the Orvis Endorsed Guide program and listed as a recommended guide by Little River Outfitters fly shop in Townsend. Check out the reviews on my Orvis page to see what others have said. My main destination is Great Smoky Mountains National Park. However, I offer a variety of wade and boat trips around East Tennessee for cold and warm water species. Take a look at this guide trip overview to learn more! The location of my guide service is in the heart of East Tennessee. Fisheries are near Knoxville, Maryville, Townsend, Gatlinburg and Pigeon Forge as well as much of Western North Carolina. The area abounds with seemingly endless coldwater and warmwater opportunities. Great Smoky Mountains National is my main destination, boasting nearly 800 miles of fishable water. Cherokee National Forest borders the park to the south and north and the Tennessee and Clinch River systems are within an hour. With so much diversity in terrain, we are able to pursue a number of different fish species. And our mild East Tennessee climate provides nearly a 12 month fishing season to do it. From hiking in for native brook trout in the Smoky Mountain high country to sight casting to wary carp on the flats of the Tennessee River, and all of the trout, bass and stripers that lie in between…. You can find your water here! Check out the section on Guided Trips to get more details on available trips. Book your trip online! I am a one man show and spend nearly every day on the water, so I can be difficult to reach. But that doesn’t mean it’s difficult to schedule a trip. No need to spend hours and days playing phone tag… You can book your trip or simply access my calendar to check availability 24/7 by clicking any “Book Your Trip” button located on every page in the main menu. Questions? Chances are you’ll find the answers on this site. If not, shoot me an email or give me a call and I’ll respond as soon as I possibly can! A resource that’s the best place to be when you can’t be on the water! The Journal is my blog page where you’ll find a number of helpful articles – from techniques, gear and fly patterns to the occasional story or rambling about the sport I am so passionate about. All articles are archived and can be perused by category or you can search for a specific topic. If you can’t find what you’re looking for, just wait… I typically add at least three new articles a month. Better yet, email me the topic you’re interested in and I’ll try to address it in a future article! Also, many of the new articles first appear in my monthly newsletter. Sign up on the Contact page so you don’t miss a thing!